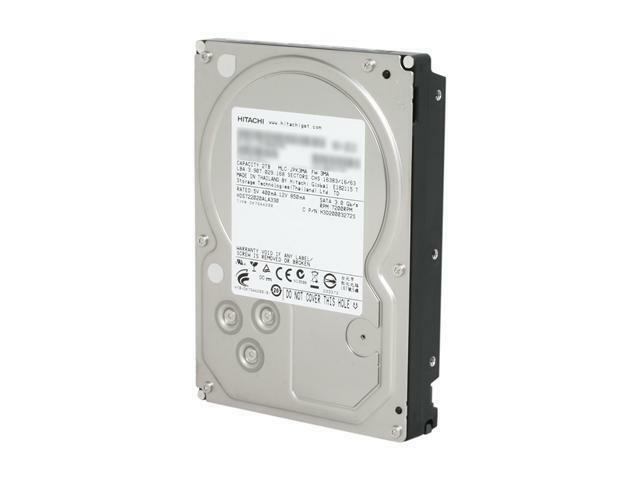 The Hitachi Deskstar 7K2000 hard drive offers top-of-the-line 7200 RPM high-capacity storage for your PC. Its proven components, robust mechanical engineering and solid performance make this hard drive suitable for demanding home and business computing. With high performance but an affordable price you need to extend your system storage with it today! High Performance Combining 7200RPM motor speed, high speed cache and large capacity, this Hitachi Deskstar 7K2000 hard drive delivers excellent performance to meet the most demanding environments and applications. Cons: heats-up, a bit noisy. Other Thoughts: bought 4 of these for my home QNAP 8 years ago! Never a problem - and my NAS is Always on... and still working. Very lucky - as I work in IT, and know how often drives fail. - 3 Year Warranty (bought an extra 2 Yrs) now it's 5 Years in which you cannot beat that price. Other Thoughts: (First one purchased Feb. 27, 2016) I cannot understand other customers experiencing issues with their drives, but the one I have is working great. That is another reason you got to love warranties. I am planning on purchasing another one very soon and hope it's another great drive. *Updated all the dates written above also for accuracy of time frame that past. Also, updated this review since you cannot add another review from another new purchase. (Purchased Dec. 24, 2016) - I did purchase another one and still no issues with either drives. Pros: The drive that was initially shipped would not install. I could hear a dreaded "click" about once a second coming from the drive and suspected that all was not well. Nothing I tried could fix the problem. I contacted EOL and they shipped a replacement that worked like a charm. Thanks. Cons: The initial drive was non-functional. Cons: 3/6 of the drives are having a ton of issues. Barely mounting, making all kinds of noises and data won't write to it. The serial numbers and dates on the drives are also miss-matched and extremely old (we're talking 7 years old) which is unacceptable considering HDD's have an average shelf-life of 5 years. Of the 6 HDD's, 1 works, 3 failed and we didn't open the last two as we are sending all 6 back.